I've not done an awful lot today apart from work at my computer so I didn't really dress up too much. 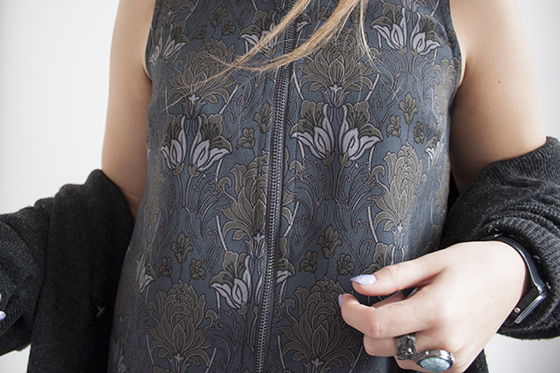 I just knew I wanted to wear this dress and layer up with a cosy vintage cardigan. It's just so warm and cosy and perfect for my drafty house! As I mentioned yesterday I decided to wear my new Topshop dress, which I adore. The pattern is just so unique and reminds me of William Morris or something like that. The shape is like the check dress I wore last week with a zip up the front, although the slit at the front is bordering on risqué but I do love it! 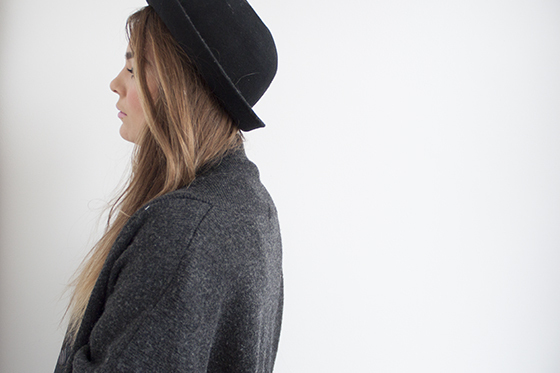 Paired with this ASOS bowler hat that I haven't taken off my head since I found it. It's just amazing and I love the way it finishes off a look and hides my dreadfully flat hair! I also made a video to go alongside this that took so much less time than the one I made the other day so managed to fit it into my schedule! Again Im happy with how it came out, hope you liked it! I've also used bigger pictures than I normally do, let me know what you think! Im tweaking little things about this blog at the moment to make it a bit more reader friendly! Any feedback will be greatly received! I love the silver necklace with this dress, it looks so good! I really like your cardigan too, cosy. I'm glad you've started doing ootd videos now! Such a gorgeous dress but the split really bothers me! Aw so pretty, loving grey at the moment! Gorgeous outfit. I love the print on the dress. that dress really suits you! you have such lovely style, I want your wardrobe! 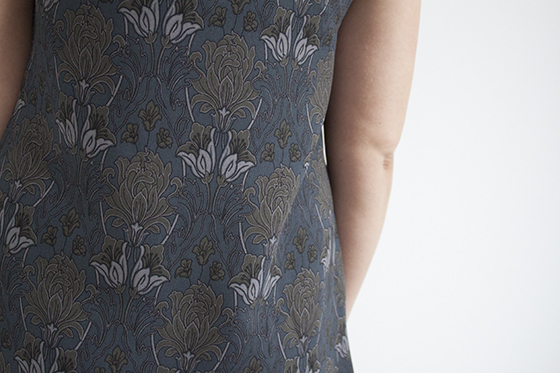 I really like this dress, it is totally William Morris-esque! I never thought I'd like this, but it looks gorgeous!!!! dress is gorgeous! love the boots and hat too! That's such a cute video Lily! I love it! And I love this outfit too, it's lovely and very different! i have the urge to yay since i saw this dress in a wish list of yours and you have it now! it looks so pretty! Love the print on the dress & your nail polish! love the nails and the pattern on your dress! loving the layout lately. I seen this dress on the website and quite liked the look of it but it looks so much better on! I absolutely love this dress!!!! really unique dress, looks great on you! I love love love that dress it's fabulous with the vintage cardigan and bowler hat. Love the hat and the print of the dress! Stylish yet comfy! definitely prefer the bigger photos! gorgeous hat, and the pattern on the dres is perfect for winter, looks like such a thick dress as well! Thank god i'm not the only one who gets dressed up just for being at home all day! I love the dress - the fit and the floral pattern. 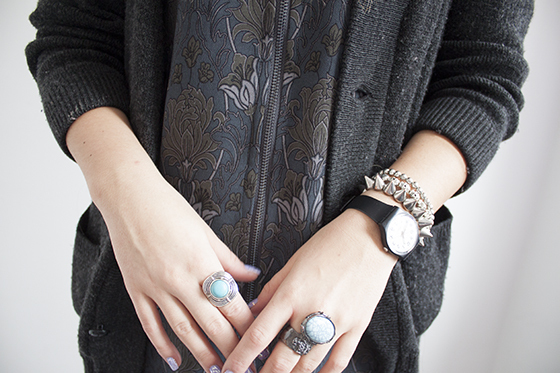 I'm not much of a floral girl myself, but the grungy-ness of this style is def. something that I would wear. SUch a cute outfit Lily, LOVE it. I love your outfit and that you do videos now! absolutely stunning dress. can't describe how much i love it! I love your videos and the bigger photos. That's such a nice pattern, I love that the zip goes all the way down the front. This dress is so good! I love the way the necklace fits around the collar. These colours really suit you.